How are the mighty fallen! Saul, breathing murderous threats, full of self-importance thanks to his powerful backers in Jerusalem, is on his way to Damascus to carry on his violent campaign against the Christians (Acts 9). But Jesus meets him on the road, blinds him and knocks him to the ground. 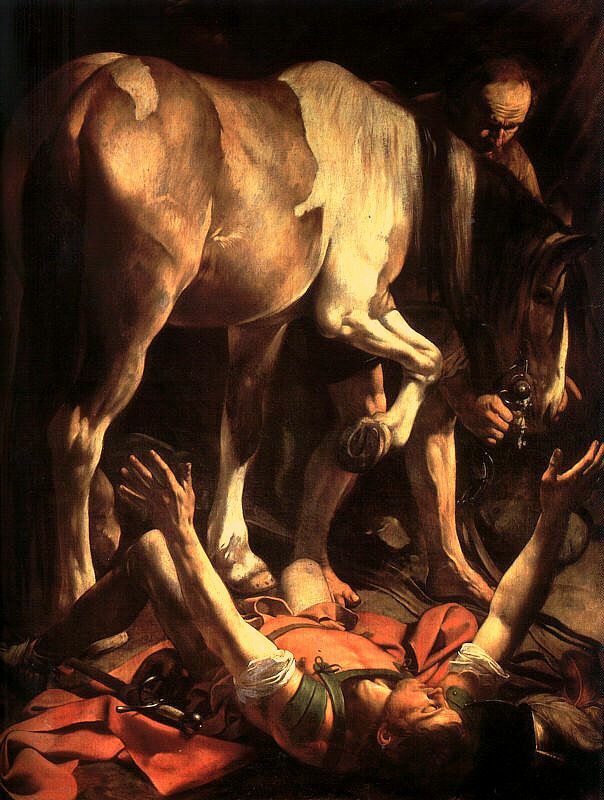 Before the middle of the 16th century this was the main thrust of images of the conversion of Saul – a proud man humbled. The horse is there to emphasise the fall: the rider has lost his seat. How humiliating! And that, of course, could have been the dramatic theme for Caravaggio. Certainly, there is Saul flat on his back. He is dressed as a warrior, bent on violence. He has dropped his sword and is groping upwards blindly, hands open, defenceless. In fact, Caravaggio emphasises Saul’s helplessness. Previously artists had shown Saul trying to get up again, but here he is prostrate and entirely vulnerable. But Caravaggio, like Michelangelo in his version of this scene painted some 60 years earlier for the Pauline Chapel in the Vatican, is not focused on the theme of pride and humiliation, but on the spiritual reality of what is happening to Saul: the direct confrontation between Saul and the risen Jesus. Caravaggio’s image is even more focused than Michelangelo’s, stripping out all possible distractions like the appearance of Jesus in the sky, the frightened horse bolting away and the startled melee of Paul’s entourage crowding round him. There are no unnecessary props, hardly any foreground, no background. Like a piece of theatre he grabs our attention by filling the stage with a few huge, highly realistic figures, arrestingly arranged and, in Saul’s case, dramatically foreshortened, using light to direct our attention. Above Saul the elderly servant is taking charge of the horse. According to Acts 9 those with Saul heard a noise, but had no understanding of what was happening to him. So the servant blends in behind the horse as a bystander. See how the servant’s two legs echo the horse’s front left leg. His face is in shadow as he is excluded from the drama that has overtaken Saul. The light falls partly on Saul. Like Michelangelo Caravaggio uses the metaphor of light from heaven to indicate the private communication that is going on. Jesus speaks directly to Paul. There is a sense that the painting has frozen a moment in time. Paul’s moment of realisation that his efforts have been terribly misdirected. The moment when his life and with it the work of the gospel and the shape of human society across the whole world will change. But the light also falls strikingly on the other leading player – the horse. Why is the horse so important? He is huge, filling two thirds of the canvas. He is clearly not there just as a prop to emphasise Saul’s fall from human pride. The light catches his flank and he is beautifully painted – Caravaggio’s realism at its best. Writers often comment that the horse is oblivious to what is happening, just a dumb animal. But that would mean that Caravaggio has devoted a huge amount of brilliant painting to a subject that is peripheral to the action. To me what is most striking about the horse is how careful it is not to harm Saul. The horse’s eye is clearly on the prostrate figure. The horse is posed with its front right hoof raised and twisted out towards the viewer as if it is being specially careful about where it is going to put it. Indeed, if you draw in the diagonals of the painting, it is the hoof that is the centre of the painting. The horse seems to stand there as a metaphor for the power of God. This animal with a strong will and immense power has the potential to inflict serious injury on the fallen figure. But in fact it is behaving with great gentleness, care and indeed compassion. There is implied violence in this scene and yet, we are being told, no one will be hurt. Saul will regain his sight in a few days’ time and he will be set on a new and wonderful road, preaching peace instead of violence, love instead of religious hatred, reconciliation for the whole world. God deals with us sometimes in shocking, sudden, even brutal ways. But always his purposes are to do us good and to do good through us. Like the horse here God is mighty and scary, but very careful where he treads. He never crushes us. On the contrary, he raises us up to new beginnings. Caravaggio: The Conversion of Saul, 1601, oil on canvas, 230 x 175 cm. Cerasi Chapel, S Maria del Popolo, Rome. Caravaggio (1571-1610) was born in Caravaggio, Italy, as Michelangelo Merisi. He was orphaned at age 11 and apprenticed with a painter in Milan. At age 21 he moved to Rome, where he received his first public commissions which were so compelling and so innovative that he became a celebrity almost overnight. His work became popular for the tenebrism technique he used, which used shadow to emphasize lighter areas. Caravaggio was a fast worker, but was also arrested repeatedly for his rough behaviour. His technique was as spontaneous as his temper. In 1606 Caravaggio's temper went a step too far. An argument with 'a very polite young man' escalated into a swordfight. Caravaggio stabbed his rival and killed him. He chose not to face justice but to leave Rome. He had no doubt that he would quickly obtain a pardon. He went to Naples and from there to the island of Malta, where his temper got him into trouble again. In the meantime important friends in Rome had successfully petitioned the Pope for a pardon, so that he could return. On the way back he fell ill, perhaps with malaria, and a few days later, alone and feverish, he died.